Although Americans make up only a small percentage of the global population, they consume more than half of the world’s prescription drugs. Unfortunately, many of these drugs are addictive. By taking a closer look at the most prescribed drugs and their dangerous effects, you’ll think twice about using them. The drug Xanax, also known by its generic name alprazolam, is a benzodiazepine for treating panic attacks and anxiety. Unfortunately, it’s also one of the most prescribed drugs in the world. Xanax is a depressant that affects the central nervous system. Its intended use is to reduce anxiety symptoms. However, its abuse leads to nausea, memory loss, lack of coordination, slurred speech, and blurred vision. Additionally, tolerance can change quickly, resulting in Xanax addiction which requires treatment. Oxycodone is a sedative and painkiller. Doctors prescribe it under the brand names OxyContin and Percocet. The drug is an opiate, like heroin, and is just as addictive. Without proper medical supervision, it can be incredibly dangerous. Additionally, oxycodone is responsible for the opioid epidemic in the United States. Many people use oxycodone without a prescription, or doctor shop to get more than one. 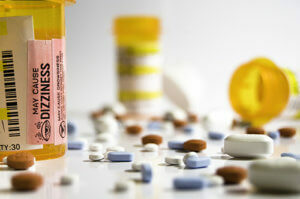 Taking oxycodone may lead to fatal overdose and countless physical and mental symptoms. A few of the most common symptoms include constipation, difficulty breathing, and unusual sleep patterns. The drugs Klonopin and Valium are very similar benzodiazepines. For example, both are sedatives and slow down vital bodily processes. Abusing Klonopin or Valium often leads to fatal overdoses or lifelong addiction. Some of the biggest side effects of these drugs include depression, chronic dizziness, slurred speech, memory problems, and aggressive, psychotic behaviors. While codeine is an opiate, it’s usually in prescription-strength cough syrups and cold medications. In low quantities, codeine is relatively harmless. However, in high doses, and when people combine it to create purple drank, codeine causes serious, life-threatening addictions. Additionally, Codeine can lead to opiate addiction. Unfortunately, recovery is similar to overcoming a heroin or opioid painkiller addiction. Rather than fighting through withdrawal, you should always avoid the recreational use of codeine. When most people think of amphetamines, they picture meth or speed. However, drugs like Ritalin and Adderall are also forms of amphetamines that doctors prescribe. Used to treat conditions like ADHD, if abused, these prescription drugs have serious consequences. Furthermore, Amphetamines are highly addictive. Chronic use can quickly lead to depression, fatigue, rapid heart rate, and even hallucinations. Even the most prescribed drugs can be addictive, but help is always available. The support and resources at 1st Step Behavioral Health in Pompano, Beach, Florida, positively aid in your recovery. Call 866-319-6126 to find the right treatment program for your lifelong sobriety.